In the world of high-end audio the terms imaging and staging refer to the complex sonic interaction of two or more speakers to produce a quality of spatial illusion in the sound field. This means sound sources are heard to be in a certain place and perspective as perceived realistically. In the AutoSound world this imaging is rarely achieved in any precisely consistent way. 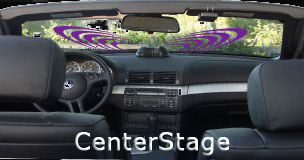 CenterStage™ joins the Upstage™ Stagefront™ system to raise the automotive listening experience to new highs. 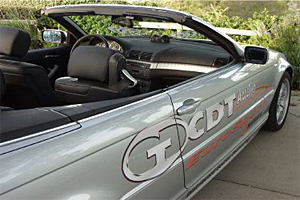 CDT Upstage Stagefront™ first lifted the stereo image in the direction of the road ahead. With the introduction of CenterStage™, the off-center perspective in a car is transformed. 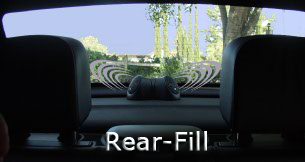 This provides each person with his or her own stereo system in the critical forward direction. Stagefront™ UpStage™ and CenterStage™ Systems may be used individually or combined synergistically to provide the ultimate personalized listening experience. The CenterStage™ ultra range 2" mid-Tweeters are driven with an image-correcting signal at a reduced level with a blending module that interfaces directly with the power amplifier. Working in conjunction with the existing right and left mounted mid-Tweeters - ultimately including extra CDT Upstage mid-Tweeters - driver and passenger are each provided personally centered staging and imaging. The CenterStage™ mid-Tweeters are mounted in the center of the dash in close proximity to each other. The centrally mounted pair provides a right and left Tweeter for each person. These CDT supplied CenterStage™ mid-Tweeters are selected to operate optimally in this Image-enhancing system. Special miniature chambered mid-Tweeters with frequency extension into the middle frequency range transform the image more completely than simple Tweeters could. The blending module employs a level control and with a provided mounting system optimizes installation and setup in any vehicle. Install and enjoy this amazing enhancement! See your CDT dealer today!